Commissioned by the Aéroports de Paris group to meet the expanding business development needs at the international business center of Roissy, this building is an example of the evolution Claude Parent’s work had undergone. Far from his early and highly sculptural structures in concrete (single family homes, shopping centers), the Aéronef (meaning aircraft), through the diversity of its materials, colors and effects, shows an aesthetic approach much closer to that of deconstruction. Its metal poles and the long plates knock together and shear the building giving the impression it is moving under the effects of some strange natural phenomenon. In its surroundings, the building appears to be an “overall turbulent form with exploded spaces covered by two ribbed metal wings.” The colors (red, black and gray), contrasted and without nuance, enhance this powerful architectural signal. The color red detonates in the gray environment of the neighboring buildings. 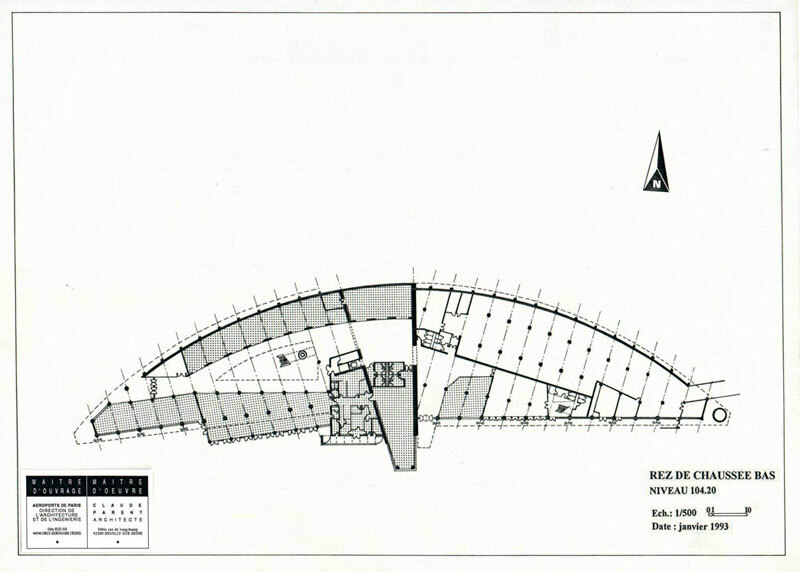 This business center shaped like the wings of an airplane is nestled in the outstretched arc of the program of offices – called the “Cupola” – located just behind. From the latter, the roof of the Aéronef is visible. Considered as a fifth façade, this great metallic wing is a reference to early airplane hangars. In addition to the headquarters of ADP, the site counts several intermodal transportation hubs connecting the lines of the TGV and the RER to the Roissy-Charles-de-Gaulle Airport (architect Paul Andreu) which Claude Parent defines as a “series of urbanized spaces, where […] the ambiance and dimensions of these interconnecting bits of the city are in direct contrast to the vanishing space characterizing the surrounding airstrips. " Roissy d'après croquis Andreu n°1 "La place"
Encre sur calque. Annotation : "maximum : 10 niveaux"